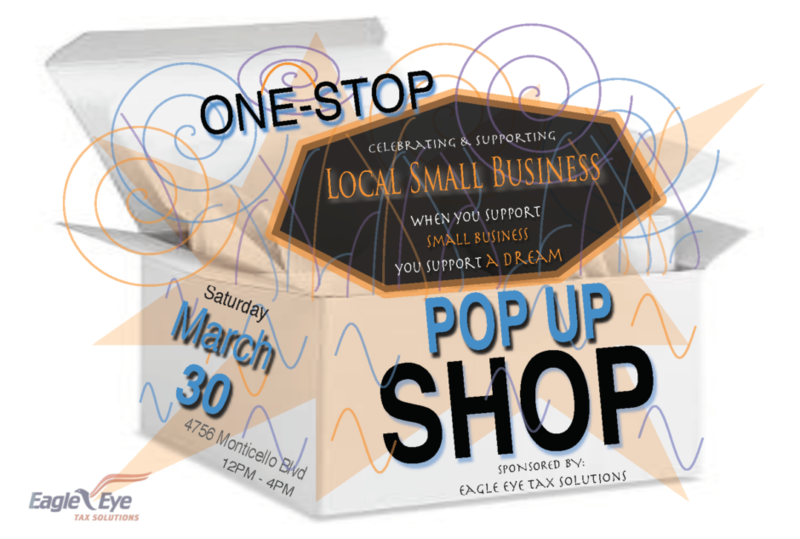 In support of Local Small Businesses, Eagle Eye Tax Solutions will host a One Stop Pop Up Shop. This local small business is reinvesting in the community that has been a huge support in it’s journey. While offering a variety of business solutions to include, tax resolution, bookkeeping, payroll, new business setup and strategic planning; the objective is to help businesses accomplish their goals and be successful. To include in this umbrella of services is now a platform to help them promote and grow in business. Through the Eagle Eye Tax Solutions Pop Up Shop at no cost, new as well as established local small businesses will be featured from our community. Registered businesses will be able to advertise and sell their products/services on the spot. President/CEO, Shanta Bonius of Eagle Eye Tax Solutions says, ‘Supporting economic development through small businesses is a vital part of the who we are at Eagle Eye Tax Solutions. Recycling the support that has been poured into our business to help other is the right thing to do.’ That’s why this event is free to small businesses and open to the public to attend. The event is scheduled for Saturday March 30th at Eagle Eye Location – 4756 Monticello Blvd., Baton Rouge, LA. Guest can stop in at any time as participants will be displayed with products and services between the hours of 12PM and 4PM. Businesses interested in registering can do so here Pop Up Shop Registration. The registration deadline is Tuesday March 26th.